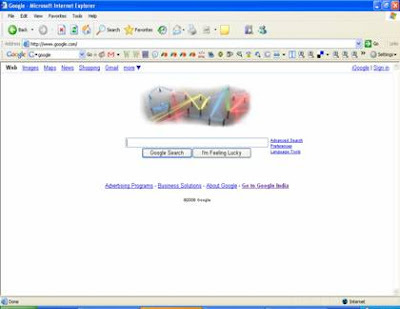 Have you seen the Google Search Engine Logo today. You might have seen it but yet not noticed it, yes it has been changed likewise Google always does so. Everytime when there is some special cause or events like Christmas, New Year, Mother's Day, Earth Day or many other Google and other search engine always change their Logo's. This new logo is "Google First Laser Invention Logo"
Now if you compare it with all other Google Logo's till time they sticked to the above pattern. But this time they came up with "Google Laser Logo" which rejuvenate their Brand. Isn't it very different from previous Logo's. If google ask me to share my view's I would say it is not that much pleasing & remarkable in comparison to previous ones. I tried to figure out Google's Message which they might want to convey by displaying this logo. It will be Google is like "Laser Rays" which is intense, coherent, directional and very pure to penetrate and can rule any Industry. Or Google Search Engine is like that concentrates user search beheaviour into an intense, narrow results by using their Algorithm used to destroy other search engines & un-ehtical results. Google might have seen the user's review that's why they changed it so quickly. How are you and things at your place? You are to be congratulated for adding such useful posts online. I have been studying your posts and I find them, very useful, helpful, and very impressive indeed. Furthermore: I have studied your comment on Sphin, and I feel, the issue needs to be raised. This is important. Since The White Hat SEO Companies in Asia are being already suffered, we will need to over-come on this, in order to let world know, we keep good eyes on the international world and we are ready to face challenges. Let us know if we could be any help.